When a professional from a developing country needs to be trained in a specific skill, how do they access this training? With funding limitations and pressing demands on their time, flying overseas to receive a week or two of expert training can be prohibitively expensive, limiting access to crucial information. 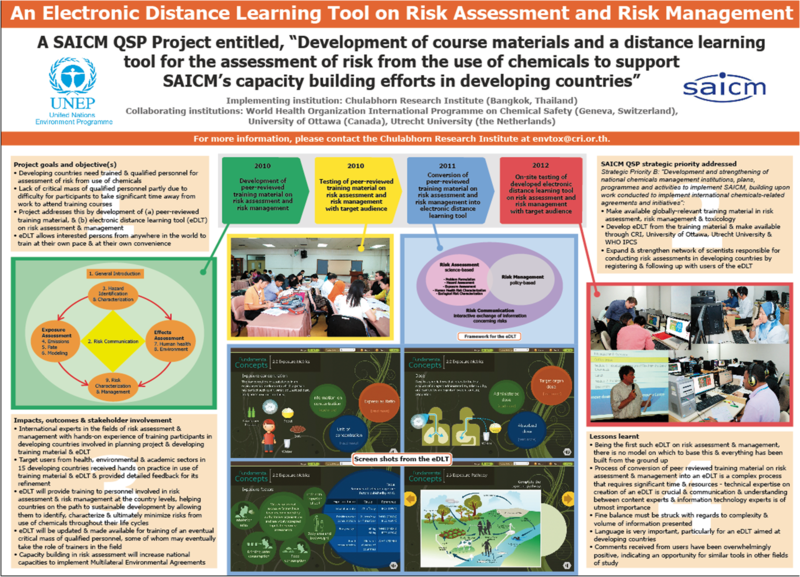 The Quick Start Programme (QSP) project tackled this problem in the field of chemicals management through the development of a ground-breaking electronic distance learning tool (eDLT) at the Chulbahorn Research Institute (CRI) in Thailand. Since its launch in 2014, it has broadened the accessibility of training in risk assessment, reaching over 400 users. However, the eDLT is not yet perfect, the two main criticisms of the programme are that it should be available in other languages, and be made available free of charge. Work is ongoing to improve the accessibility of the website and the content, and new modules, including the development of case studies, are being developed.